Consider how keys and other valuable assets in your organization are stored and managed. Sadly, many organizations don’t have a manageable method of tracking the location and use of valued assets. Also consider the amount of time wasted and lack of efficiency around an un-automated key management system and the lack of accountability your employees and vendors have when it comes to keys, assets, and company vehicles. Physical keys are not going anywhere in the near future. For many of us, they are still the primary way we enter our car, our house, and our place of business. Within companies, there are a number of applications keys serve as well: master keys, access to certain parts of the building, the ability to power and control a machine, confidential filing cabinets, and company vehicles. Some organizations also have assets that need to be protected, such as common use tablets, cameras, or other electronic devices. Ironically, while most organization rely heavily on keys for crucial business operations, very few have a successful method of controlling accessibility and maintaining accountability of those who use the keys. 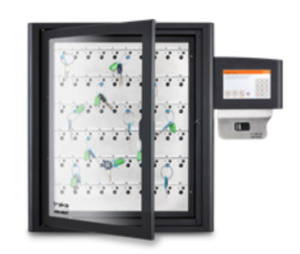 When you can control, monitor, and record your company’s key use, your valuable assets are more secure than ever, and locker solutions allow you to secure and manage your physical assets and only allow authorized users to access them. Keys aren’t always easily accessible to those who need them the most. Sometimes there is only one key available and one location for key storage, meaning employees have to travel to the key, obtain the key, travel back to the locked location, use the key, and then return the key to its original place. For organizations with campuses, experience shows this can be a huge time waste. For example, school and university campuses can spread for miles, making the travel like scenario above highly unproductive.. There are options available to have multiple key lock boxes spread throughout the campus so that users can easily access the keys they need at any location. Besides travel, lack of key organization can be another waste of time. Remember those movies that show a janitor fumbling through every single key on his heavy key ring before he finally finds the right key for the door? Key management solutions make that scenario 100% avoidable. Think about a machine shop with many high-tech, complex, and potentially dangerous machines that only a handful of trained operators in the workforce can control. Without some form of access control, it’s easy for an untrained operator to use a machine and risk damage to themselves, the facility, and the organization. Organizations can have hundreds of thousands, if not millions, of dollars connected to assets that keys control. It’s a huge liability to a company to risk unauthorized personnel getting their hands on the literal keys to the kingdom. Key and asset management solutions are far more than a box that stores and organizes keys and assets. Traka, probably the most respected key management brand, has many intelligent features built into their solutions that create even more efficiencies and data for the user. The status of keys and assets can also be viewed on a desktop or mobile device in real time, keeping administrators up to date on the current location and uses of the assets as well as transaction history, reporting tools, reserved assets, and more. Better yet, asset and key management can be fully integrated into the rest of your critical systems, such as access control, video surveillance, work orders, ERP systems, and time & attendance. TSG Security specializes in the security and safety of businesses, schools, and government bodies. If you’re interested in key cabinet solutions for your organization, contact us today to learn more.